Betsy has a background in education and international development. She has worked with youth-focused organizations in Ecuador, Chile, and Bolivia and taught in Washington, D.C. and Atlanta. Betsy holds a M.A. 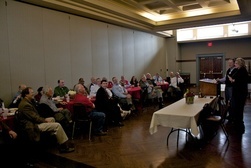 in Teaching from American University and a Masters in Development Practice from Emory University. 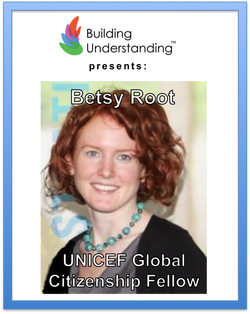 Join Betsy Root and learn about how she is fostering global citizenship and uniting people to take action for the world’s children in her role with the U.S. Fund for UNICEF in the Southeast Regional Office. The United Nations Children's Fund (UNICEF) works in more than 190 countries and territories to save and improve children's lives, providing health care and immunizations, clean water and sanitation, nutrition, education, emergency relief and more. The U.S. Fund for UNICEF supports UNICEF's work through fundraising, advocacy and education in the United States. Motto is: "We're working toward the day when ZERO children die from preventable causes and every child has a safe and healthy childhood."